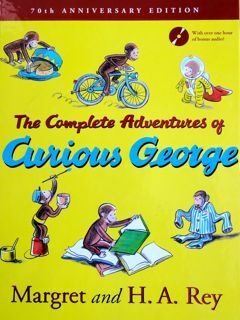 One of the latest additions to our bookshelf is The Complete Adventures of Curious George by Margret and H.A Rey, which contains seven stories about the adventures of this mischievous, lovable monkey. My children adore it and it has been top of the request list for bedtime reading ever since the postman delivered it. In case you don't know the books, George is a very curious monkey whose inquisitive nature gets him into all sort of scrapes. He has been popular with children for 70 years putting him firmly in the list of classic children's picture books. For such a small and simply drawn monkey, George has a very expressive face which reflects a range of different emotions as his adventures unfold - excitement, enjoyment, fear, embarrassment, sorrow. Miraculously, however, things always seem to work out for the best in the end, and we are left once again with a happy, smiling monkey. It was these expert illustrations by H.A. Rey of a variety of emotions which made me think of using Curious George stories to show my children how to connect more closely with characters in books and specifically, in this case, to explore the emotions a character is feeling. 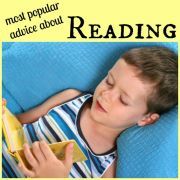 When we read a book to our children we want them to understand more than just the basic plot of the story. 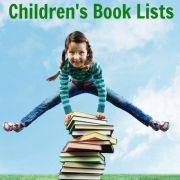 We want them to identify with the characters, grasp the mood of the story and become emotionally involved in the text. 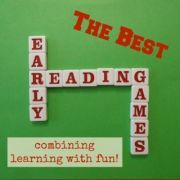 If they can do this children do better at remembering, enjoying, understanding and learning from what they read. 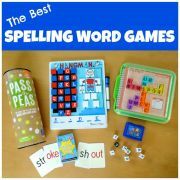 One way of helping your child to make connections to a book is to encourage him to "read between the lines", using clues from the text and pictures in the book and from his own experiences to deduce something which isn't stated explicitly in the text. This technique is known as 'inferring' and is one of the reading strategies which readers can use to connect more deeply with what they are reading. 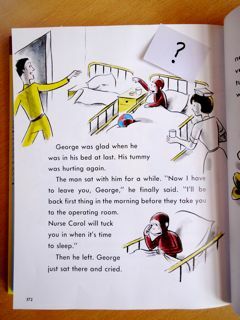 In this activity I encouraged my children, who are aged four and nearly six, to decide what Curious George was feeling at various points in the story. We could have purely had a conversation about it, but I find that their enthusiasm for conversations while reading books is pretty limited. They just want me to get on and read. So I decided to make the discussion a bit more interactive by asking my children to attach sticky notes with emotions written on them to appropriate points in the story. Keep reading for the details of what I did. Obviously if you choose to do this with another book, you can substitute your chosen character for George. Go through the story by yourself and identify a point in the story where George demonstrates an interesting or different emotion. Mark this point in the book with a small sticky note with a question mark written on it. 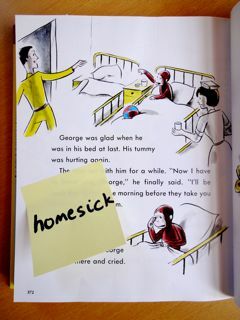 On a larger sticky note write an appropriate emotion which George could be feeling at that point. Stick this randomly to a large piece of card, which I called the Emotion Bank. I glued a photocopied picture of Curious George in the centre of the Emotion Bank, but if you intend to use this technique for a variety of different books you may want to just write "Emotion Bank" in the middle. Continue going through the story and repeat steps 1 and 2 for each of George's different emotions which you want your child to identify. 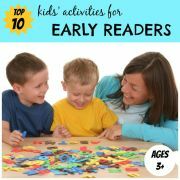 Now introduce the activity to your child. 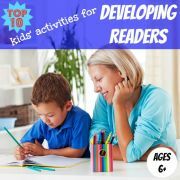 Explain to him that when we read books it can be fun to pretend to be detectives and find out more about the story just by listening closely to the words, looking carefully at the pictures or thinking about our own experiences. Here we are going to try this to find out what Curious George is really feeling. Show your child the 'Emotion Bank' and go through each sticky note in turn, reading the notes with him and making sure he understands what each emotion means. If he is not sure, give an example of when he might have felt that emotion recently: "People feel guilty when then feel sad for having done something wrong. Perhaps you felt guilty when you broke Daddy's special pen". 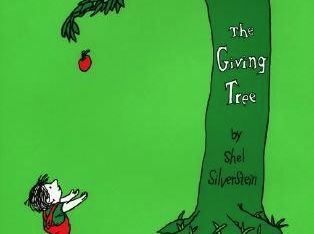 Start reading the story with your child. When you get to a place with a question mark, ask your child what they think George is feeling at this point. Read through the emotions on the sticky notes if necessary for inspiration. When your child tells you what he thinks George is feeling, ask him what made him think this. For example, was it the expression on George's face, the words of the story or your child's own experience of having been in a similar situation. 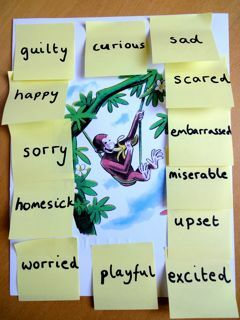 Ask your child to stick the appropriate sticky note from the Emotion Bank onto the page. If you haven't already discussed it, see if he can give you an example of when he felt that emotion recently. Continue reading until you get to the next question mark and then repeat steps 6 and 7. Carry on until you reach the end of the story. I wasn't really sure how my children would take to this activity, but they both happily joined in and enjoyed it, typically arguing about whose turn it was to attach the sticky note to the page. I think the added interest of sticky notes really helped since they didn't at any point ask me just to get on and read the book. They recognised that this was an activity they needed to participate in, rather than purely storytime when they could just sit back and listen. If you have older children, you could ask them to write the sticky notes themselves, choosing the most appropriate emotion they can think of to go on the note. Have fun getting sticky and making connections with The Complete Adventures of Curious George!